Image Size: 30"w x 18"h.
Several years ago, Tom Gilleon began collaborating with Marshall Monroe, a fellow veteran of Disney’s Imagineering studio, on a new kind of digital artwork, a multiplatform and transmedia storytelling piece, called "Hungry Fox Equinox." The ensuing digital installation is comprised of 24 Gilleon paintings of a tipi in nature which fade in and out and over each other to create a very slow animation that tells the story of a single day in just a few minutes. Around and inside the tipi, the light changes, snow falls, smoke rises, a flute is heard in the distance. 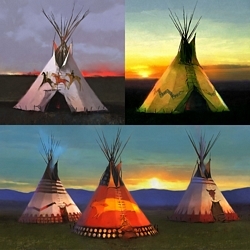 The tipi is the only thing that remains more or less stationery in the digital painting. The installation premiered at the C.M. Russell Museum in 2014 and was sold at their Silent Auction and Art Preview for $250,000 to an anonymous buyer who donated it to the museum’s permanent collection. The Greenwich Workshop is honored to publish a dramatic fine art edition from the "Hungry Fox Equinox" digital painting, complete with . . . yes, the hungry fox, the equinox and soft light glowing from the tipi closed tight against the snowy evening.